For the beginner and advanced the manufacturer Milwaukee has included with the M12* a device for the practice in the assortment. It is intended for the verification of electrical circuits and heating construction and has a 120 x 120 pixel sensor. Read a detailed description of the thermal imaging camera with all strengths and weaknesses as well as a final conclusion. With the 160 x 120 pixel resolution one can still see – according to the manufacturer – a 1 x 1 inch object of a distance of 5 meters (16 feet). Or another way to put it: an object with the size 30 x 30 cm (1×1 foot) fills exactly one pixel at a distance of 60 meters (197 feet). Six buttons are available for operation. Below the display is a navigation element with four directions and a pressure point in the center for switching on the device and opening the menu. An integrated LED can be switched on with the button on the right-hand side – practically when shooting in a poor light environment. However, the thermal image of the IR camera is not affected. The left-down image-switch toggles between visual and thermal images. It is the “Play” button that allows you to switch to gallery view immediately. Use the back button to return to live mode. With the trigger at the front, the recording and the saving of the image which is shown on the display are triggered. The IR and visual image of the thermal imaging camera are simultaneously stored in the memory. The thermal images are stored internally on the supplied 2 GB SD card in JPEG format. According to the manufacturer, an average of up to 300 images sets (thermal + visual) can be stored. An upgrade up to a capacity of 32 GB (approx. 4800 picture sets) is possible. The sharpness of the thermal image can be adjusted via a rotatable focus ring at the front of the thermal imaging camera lens. The visual image, on the other hand, does not have to be focused, since a fixed focus is used. In the visual viewing mode, you can toggle between the visual image and the thermal image. The display shows the temperature measured at the center of the picture, along with a scale from cold to hot. The setting possibilities are limited. The emission coefficient can be adjusted as desired, also a few configuration options are possible for the temperature scale. Three different color palettes for displaying the thermal information are available (iron, rainbow and gray). Convenient is the charging time with the quick charger of only 30 minutes. The battery is disconnected from the thermal imaging camera and plugged into the supplied external chargers. With the M12 thermal imaging camera, beginners and advanced users can quickly perform thermal examinations without much prior knowledge. Particularly suitable is the camera for the verification of electrical installations and industrial superstructures. The M12 can also be used for control and fault finding in heating engineering. The M12 has a 160 x 120 pixel sensor (uncooled microbolometer array) for a wavelength range of 8 to 14 μm. In the visual area, the camera delivers images in 1.3 MP resolution with a required minimum distance of 30 cm and 56 ° x 46 ° FOV. The temperature range, which can be detected from -10 ° C to 350 ° C (14° F to 662° F), is absolutely practical. The thermal sensitivity is indicated with 0.1 K, with an accuracy of ± 2 ° C or ± 2% of the measured value. 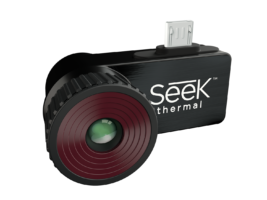 This thermal imaging camera has a manual focus, i. the thermal image must be optimally adjusted via a focus wheel in order to obtain sharp images. The minimum focus distance is only 10 cm (0.3 feet). The field of view is 25 ° x 19 ° (horizontal x vertical). 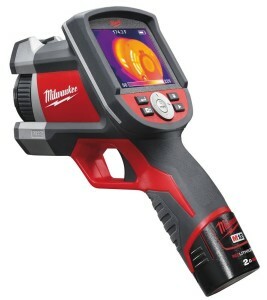 The MILWAUKEE Thermal Imager Report Software is included. It essentially serves to transfer and view thermal images from the M12 to a PC or laptop. The software runs on Windows PCs with XP, Vista or Windows 7. The temperatures can be measured point by point in the thermal images. The representation can be changed with the aid of color pallettes in such a way that critical details are easier to recognize. In addition, there is a possibility to insert comments and hints into the pictures themselves. As the name of the software already reveals, another major component is the automated reporting of recorded thermal images. You can select the desired images to appear in the report and add to them any comments. Finally an export as PDF for printing, sending or saving is possible. 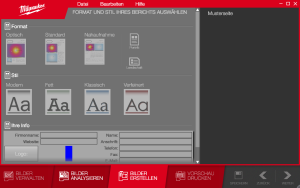 In the “analysis” menu item, the rudimentary tools can be used on the PC to perform a thermal analysis of the images. These include spot measurements with individual emission coefficients, average temperature of an area, add notes and adjust the color palettes. The Milwaukee M12* is without doubt practical and easy to use. 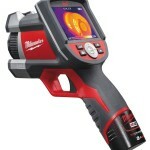 Unfortunately, this thermal imaging camera is relatively expensive, which somewhat lower the price / performance ratio. Fancy additional functions can be found neither in the thermal imaging camera nor in the associated analysis software – but this can also be a plus for some users.